See also T. capitata for other un-named varieties. See notes below by Derek Butcher and Chris Larson. 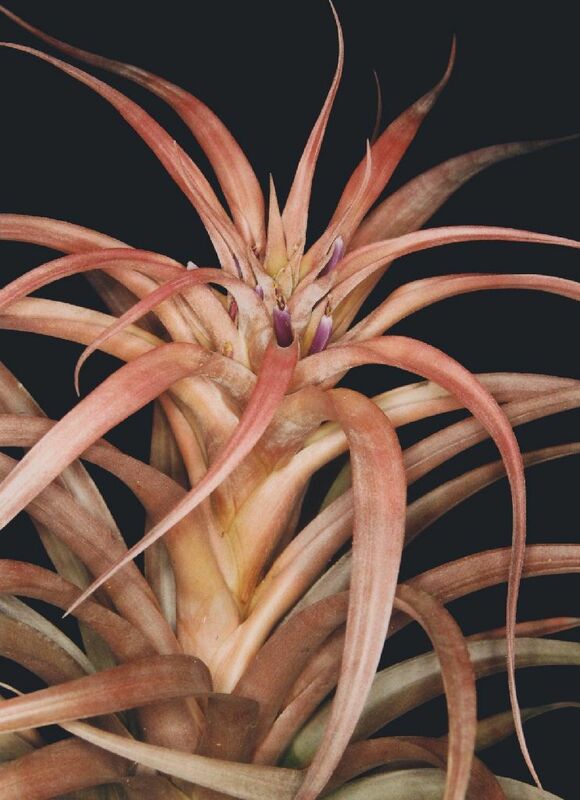 Stephen Haines 01/15 John Catlan 01/15 as capitata 'Red'. Recently the name ‘Roja’ has caught the notice of the Registrar Geoff Lawn because it has been cited as a parent of a new hybrid but had not been registered. 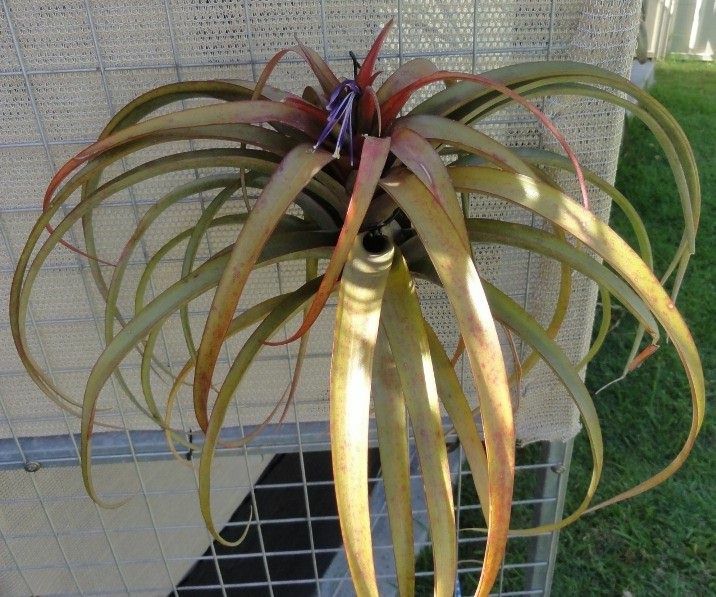 I have been interested in the variability of plants collectively called T. capitata by Botanists and in 2002 presented a paper at a biennial conference of Tillandsia enthusiasts at Albury, Australia. As an amateur I was trying to get some semblance of order basing my findings on numerous collections by Renate Ehlers. The only solution seemed to be on geographical grounds based on where the plants were found. I then tried to link these plants with plants being offered in the nursery trade. I regret I was unable to get clear links probably because of variability in growing conditions. My grumble was the lack of locality collection data from Nurseries. There are a number of reasons for this which I will not elaborate on. After 25,000 miles of traveling throughout Mexico, I have finally come to the conclusion that the red form of Tillandsia capitata is indeed rare. 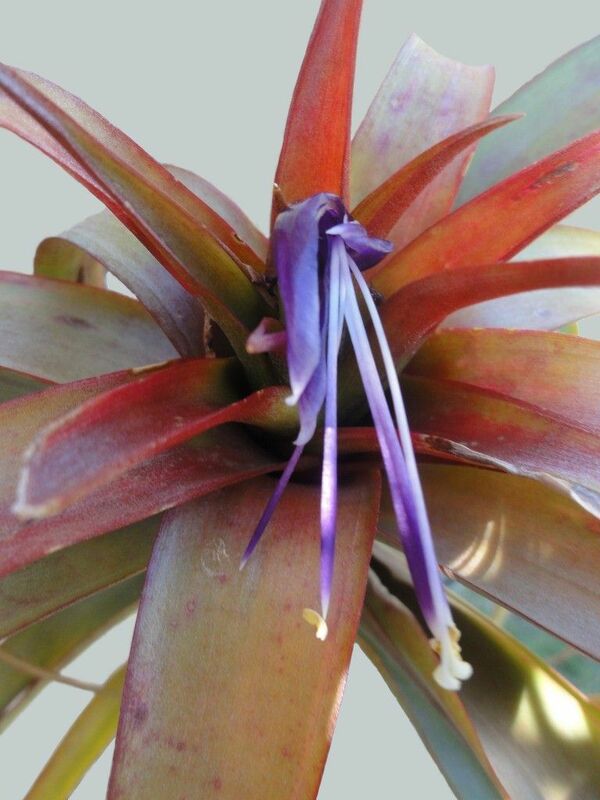 I first saw this beautiful bromeliad on a plant collecting trip some seven or eight years ago which was made by Bill Seaborn, George Kennerson, Ed Collins, Steve Talnadge, and me. After collecting a number of plants, I remember leaving Mazatlan for some bromeliads that Bill said he had to find. What they were, I did not know. We traveled east towards Durango, stopping from time to time gathering tillandsias. We had traveled for an hour or so, when suddenly George and Ed in the lead truck turned off the road, followed by Bill and me in the second truck, and Steve Talnadge in the third. There was hardly room enough for one truck, let alone three, as everybody knows who has traveled in Mexico, and there is very little room anywhere along the highways of Mexico to stop, even for emergencies. Suddenly George stopped and stepped out of his truck and very excitedly pointed towards the wall of a barranca. The mid-afternoon sun was shining directly on a mass of red plants high up on the barranca. From where we were they couldn't be identified. We looked in vain for plants that were within our reach, but there weren't any. So George and I decided to climb up the steep cliff. The slope leading to the plants was gravelly and crumbling. It was not hard to climb the first half of the slope, but as it became steeper, we were practically crawling. It got to the point where we were clawing up three feet and sliding back two, but by helping each other, we finally made it to the top, some 800 feet high. After our long struggle, what did we find on the top? Nothing, but rocks and a few shrubs; the bromeliads were growing just below the brim of the cliff. We lay down on our stomachs hanging over the edge and while one of us scraped the plants up against the side of the rock, the other would reach down as far as he could for them before they fell. Lacking a container in which to carry them we got as many as we dared carry, for the trip down wasn't going to be any picnic. But we finally made it, and drove onwards towards Durango. We had no idea what we had collected. This trip was my initiation into plant collecting. On subsequent excursions to Mexico I have gathered more of this tillandsia at the same location - always a difficult job. In January 1976, I made an extensive trip to Mexico, accompanied only by my mixed shepherd dog, Flora. This trip was planned mainly to seek out, collect, and identify bromeliads and cacti and on occasion a few orchids. I entered Mexico through El Paso, traveling south on Highway 45. I concentrated on cacti from the American border to the state of Mexico. Tillandsia macdougallii and a few other species of tillandsias were collected on the way to Fortin de las Flores, Vera Cruz. I believe Fortin is and has been the headquarters for collectors for many years. Posada Loma, a motel, and a charming place in a beautiful setting, is a central location, a hub from which radiate all roads leading to the different plant locations. During my stay at Posada Loma there were five different parties collecting - some searching for bromeliads, some for orchids, and others for cacti. From Fortin de las Flores I headed south to the Monte Bello National Park in the state of Chiapas, the park bordering Guatemala. On my way back on Highway 190 I gathered T. seleriana, T. carlsoniae, T. matudai, T. butzii, T. magnusiana, a tillandsia which looks like T. carlsoniae except that it has a red flower spike, a tillandsia which looks like T. imperialis but is about three times larger. When I arrived at Tuxtla Gutierrez I turned west towards Villa Flores. Here I found a number of cycads, including Dioon edulis var. purpusii and several species of Ceratozamia. I also found a second location of the red capitata, a small colony which will probably be exterminated within the year for agriculture. Mexico, on the whole, is on a clearing program - clearing and burning the native plant life for agriculture. I collected two plants from this area to compare with those from Durango. Turning back to Highway 190, through Tierra y Libertad, I collected other tillandsias. Flora and I camped a short distance from Oaxaca on Highway 125 which leads to Puerto Escondido on the west coast. This road has a wealth of tillandsias, cacti, and other succulents. Here I found a third location of the red capitata. It was another small colony, which will also be cleared away to make for agricultural purposes very soon. I noticed that these last two locations were not on high inexcessible rocky formations as in Durango, but rather on high, tall, deciduous trees - also very dry areas on the west side of the sierra. From Highway 190 we turned northeast at Telixtlahuaca towards Teotitlan and Tehuacan. On the way I noticed T. pueblensis in plentiful supply as was T. concolor. This is a very dry area. After collecting around Tehuacan, I returned to Fortin, where I rested and cleaned my plants. Leaving Fortin de las Flores, I took Highway 150 to Highway 190 to Azucar de Matamoros and on to Azizintla near Taxco picking up T. caput medusae on the way. From this point I drove to Toluca, and on to Colima, collecting a few varieties of tillandsias on the way - varieties which I did not recognize. Somewhere along Highway 110 between Tamazula and Colima, I saw another colony of T. capitata, the red variety. These were on boulders, like in Durango, growing on the west side of the rocks. From Colima, I went on to Manzanillo and at Barra de Navidad I took Highway 80 to Guadalajara. On this road I found the green form of T. capitata. Here again this tillandsia was growing on high sheer cliffs growing in the cracks of the barranca. There was also a very small tillandsia which I collected near Autlan. It measures about 2 1/2 to 3 inches tall. Its texture and form are very much like that of T. capitata, but the leaves are chartreuse; it has not flowered as yet. On this road also grow T. baileyi, T. caput medusae, T. circinnata, the proliferating variety. From Guadalajara I followed Highway 15 to Mazatlan and the motel Flamingo where arrangements were made for the ferry to La Paz in Baja. While waiting for the ferry I decided to go north to La Cruz to collect T. exserta. I camped in an area that was being readied for clearing. About eight o'clock at night four dump trucks and two dozers moved in next to me and camped. Before daybreak they started to bulldoze the whole area. Some debris was hauled away and some was piled up to dry and be burned. While all of this was going on I was jumping from one felled tree to the next collecting T. exserta. I packed the last I had left and squeezed it into the camper. By two o'clock I was on my way back to the ferry and arrived just in time to board it. From La Paz to Tijuana it's all desert traveling with the exception of a few agricultural areas along the way. The only tillandsia I have ever seen in Baja California is T. recurvata. If any of the readers know of any others I would like to know. Arriving at the Tijuana-San Ysidro border, I had completed a three-month trip through Mexico, logging 16,000 miles - a long trek in search of tillandsias, and I was glad to be home. Regarding the red T. capitata, I made several observations, which may be of interest to those who grow this beautiful plant. First, the elevation at all locations, a total of five, was between 3,500 and 4,000 feet. Second, they were also between 35 to 45 miles away from the Pacific Ocean. However, there are probably other areas which 1 had not discovered being a novice collector. Third, all the red capitatas were growing in full sun and in arid conditions. Fourth, in all areas they were growing on the west side of the barrancas or sierras. Fifth, only in three locations were they growing on rocks. The ones growing on tall deciduous trees were bigger, but not so red, the same way they grow in cultivation. No detail is given other than colour which is not much use to the Botanist but is of interest to the Nurseryman. “This is from Mexico and was originally in the trade in the 1970s as a wild collected plant called Tillandsia capitata rubra. I have no idea from whom we got the original plants, it was undoubtedly from one of those "pot and brush" guys who appeared on the scene for a bit and then disappeared. The name rubra can't be used so I called it T. capitata ‘Roja’ which is Spanish, not Latin so it can be used. Checking around other US nurseries I find Tropiflora offering T. capitata ‘Red’, Tillandsia International offering T. capitata ‘Rubra’, and Bird Rock Tropical offering two forms of T. capitata ‘Rubra’. Are these similar or different botanically or horticulturally? To the keen grower I suggest you take note of the name of the supplier. The T. capitata group is very variable throughout Mexico, and Central America. In reference to the names T. captata Roja (Isley), T. capitata Rubra (Koide) - I believe that these are the same species, which are equal to the species aff. T. capitata from the area of Pochutla Mexico. The foliage is red all the time. In the '80's I called it T. capitata v. rubra, which is incorrect as it was not published as such. Isley called it T. capitata Roja, as that may be more correct since the name is Spanish and not Latin. I propose that it be called T. capitata 'Pochutla', as this adds the provenance. Another capitata with two names is T. capitata Marron (Isley) and T. capitata 'Old Gold' (Koide and Bill Baker). Bill was the first to coin this name, so we adopted it. Isley calls it Marron. They are the same plant. This is also a geographically isolated population of capitata from Western Mexico. Throughout Mexico the separate and distinct populations of capitata are different. They vary from having green, red, silver or whitish leaves. Some turn yellow in the center, some lime green, some stay blood red. Some are tall, some short, some yellow,pink, orange, peach, red...but in each locality they will be the same. I think that these species, if you want to register them, should be registered with a locality type name, so that the populations are what you are addressing. As Derek says- it is obvious from the photos what color it is. Since the group may end up at some time in the future with different names, it makes sense to keep the locality with it. An example is T. jalisco-monticola and T. magnispica. When I found T. magnispica in the '80's, Harry and Renate insisted that it was T. jalisco-monticola. I disagreed, so I kept the plants separate, with a separate ID number and kept the locality of Oaxaca on them -labeling them as T. jalisco-monticola (Oaxaca form). In 2009 it was determined that the Oaxacan form is a new species and named T. magnispica. This made it easy to change the labels to the new name, and not have them confused with T. jalisco monticola. Although, other nurserymen did not separate the populations, and that is why today, many collectors have plants labeled T. jalisco monticola, and they are actually T. magnispica. I think this also goes for the T. fasciculata group. Another group of species that is variable, and many may end up with new species names. John Olsen - Adams comment re size is a key point. I have difficulty separating Roja, red ( Mexican red select red) ,scarlet, rubra plants. My orange capitata is only a bit off red. I can differentiate my basic Reds from my tall red form. I also have tall orange and the tall yellow which has been around longer. So we really have 2 forms - short and tall. I have 3 colours in tall and red, orange,pink, purple, yellow, green in the short. I've left Peach and Rio Hondo aside. If we go down the registration path separating them I suggest using nursery man's naming - tall red etc rather than create a new moniker which doesn't carry meaning.